Hello ... Hello ... my old friends ... It's great to see you once again! Lots of folks fondly recall their memories of buying their first record. And my recollection of my first vinyl purchase is doubly so because it was "Turn To Stone" b/w "Mister Kingdom" by the Electric Light Orchestra [Jet/UA #UP36313] in that rather fetching deep blue sleeve complete with THE classic ELO logo. Yours Truly KJS can still remember buying the famed 7" from Finlays, a confectionery shop on the Stafford Road in Oxley, Wolverhampton, who also happened to sell the Top 40 singles of the day. 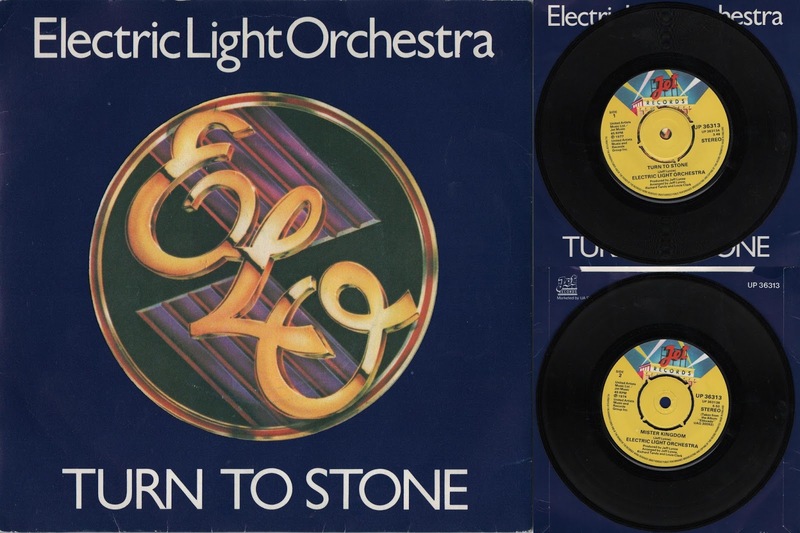 Credit will always be due to my elder brother Bob, who introduced me to both ELO and The Move. They were great days indeed and I'll never forget that first vinyl buy of mine, closely followed, if I remember correctly, by "A New World Record" at just 18p a week from my mum's catalogue! What was first record that you bought? Was it by The Move, ELO, Wizzard, Roy Wood, The Idle Race, The Beatles or someone else in the ELO Beatles Forever [ELOBF] universe?